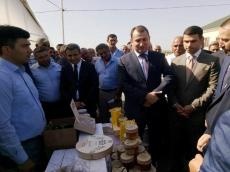 As part of the projects implemented by the Economy Ministry of Azerbaijan jointly with the Turkish Embassy, the sale of products manufactured in greenhouses and beekeeping farms established in Jojug Marjanli village of Jabrayil region has already begun. Deputy Economy Minister Sahib Mammadov made the remarks at the event held in Jojug Marjanli, adding that the implementation of joint projects in the village once again bears evidence to the Azerbaijani-Turkish friendship. “The implementation of such projects is important in providing employment in the villages, social and economic development of the region,” the deputy minister said, noting that the products produced in these farms have already been put up for sale under the brand “Jojug Marjanli”. Taking their turns, Turkish Ambassador to Azerbaijan Erkan Ozoral and Coordinator of Turkish Agency for Cooperation and Coordination (TIKA) Baku Office,Teoman Tiryaki noted the successful development of Turkish-Azerbaijani relations, the importance of implementing joint projects in Jojug Marjanli in agricultural development. Speaking at the event, Chairman of the Board of the Agency for Small and Medium Entrepreneurship Development Orkhan Mammadov informed about the measures taken by the agency, further saying that entrepreneurs operating in Jojug Marjanly will receive full support. Within the framework of the implementation of joint projects of the Azerbaijani Economy Ministry and the Turkish Embassy in Azerbaijan in Jojug Marjanli village, 15 tunnel-type greenhouses with a polyethylene coating were installed, each covering an area of ? ?160 square meters. Greenhouses are equipped with a drip irrigation system, seeds, fertilizers and pesticides, tools and equipment for plant care are handed over to users. In addition, 10 honeybee colonies were transferred to 15 families in Jojug Marjanli. Each of the bee farms is provided with 10 two-storey beehives, beekeeping equipment, materials and medicines. Jojug Marjanli was liberated by the Azerbaijani Armed Forces from the Armenian occupation in April 2016. In late January 2017, President Ilham Aliyev ordered to restore the village. During the first phase of restoration, 50 private houses, a school, mosque, electric substation, hydrometeorological station, highway and other relevant infrastructure were constructed in Jojug Marjanli. The village was provided with gas, electricity and water supply. The second phase of construction and restoration work and work on improvement and creation in Jojug Marjanli started on June 15, 2017. Within the second phase, new houses are being built and infrastructure is being enhanced in the village.